Sarah Huckabee Sanders is not having a very good month, and Monday’s White House press briefing didn’t help to cheer her up. 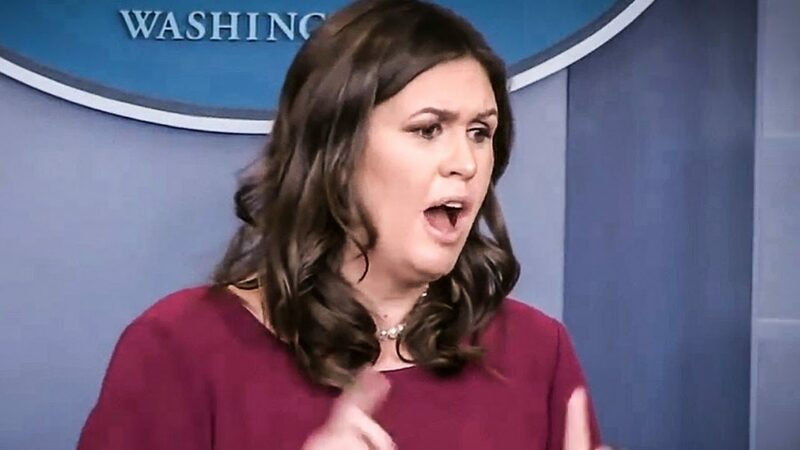 When confronted by CNN’s Jim Acosta about her boss’s constant references to “fake news,” Huckabee Sanders grew visibly angry, lashing out at Acosta and others in the room, while contradicting herself throughout her diatribe. Ring of Fire’s Farron Cousins discusses this. White House Press Secretary Sarah Huckabee Sanders is really having a bad few weeks. Things didn’t get any better on Monday during the White House press briefing when she was speaking with CNN’s Jim Acosta about her constant, and Donald Trump’s constant accusations that that network and many other networks are completely fake news. The exchange seemed to get a little bit heated there for a few seconds with Huckabee Sanders lashing out, both at Acosta and other people in the room. Take a look and see exactly what happened to Huckabee Sanders on Monday. Sarah Huckabee Sanders:	… any misinformation like that very seriously, but it’s not something we’re comparing the two on. Sarah Huckabee Sanders:	But when journalists make honest mistakes, they should own up to them. Jim Acosta:	We do all the time. Sarah Huckabee Sanders:	There’s a very big … I’m sorry. I’m not finished. Jim Acosta:	[crosstalk 00:01:07] something that was completely fake, Sarah. Jim Acosta:	He admitted it. Sarah Huckabee Sanders:	You cannot say that it’s an honest mistake when you are purposely putting out information that you know to be false or when you’re taking information that hasn’t been validated, that hasn’t been offered with any credibility and that has been continually denied by a number of people, including people with direct knowledge of an instance. Jim Acosta:	Are you speaking about the President? Sarah Huckabee Sanders:	I’m speaking about the number of reports that have taken place over the last couple of weeks. I’m simply stating that there should be a certain level of responsibility in that process. Jim Acosta:	This was not [crosstalk 00:01:41]. Sarah Huckabee Sanders:	Hold on, Jim. Jim Acosta:	This is not the line of questioning I was going down, but can you cite a specific story that you say is intentionally false, that was intentionally put out there to mislead the American people? Sarah Huckabee Sanders:	Sure. The ABC report by Brian Ross. I think that was pretty misleading to the American people. I think that it’s very telling that that individual had to be suspended because of that reporting. I think that shows that the network took it seriously and recognized that it was a problem. Jim? Jim Acosta:	Sarah, if I may though, I was going to ask a question about something else. Sarah Huckabee Sanders:	Well, you used it on something else. Jim. Sarah Huckabee Sanders:	We’re going to keep moving, guys. Sarah Huckabee Sanders:	I’m moving to a different Jim. I’m sorry. Sarah Huckabee Sanders:	Jim, I’m going to say once and for all that I’m moving on to Jim Stenson and I’m not taking another question from you at this point. Reporter:	Sarah, a question about investment, investment taxes. Jim Acosta:	[crosstalk 00:02:34] tax on [inaudible 00:02:35] if that’s okay. I would like to ask the question that I had about these accusations of misconduct against the President. You said that he’s denied them, can you say whether or not they are false? Sarah Huckabee Sanders:	I’m not going to respond to another question. Go ahead Jim. All right, first and foremost, she absolutely contradicts herself in that clip. She says that these people pushing out fake news, pushing out these stories need to be held accountable. Something has to be done. Well guess what? Brian Ross, the guy you cited and then later admitted that ABC News did the right thing, you started by saying you’re pissed off that they’re not doing the right thing, then you later admitted that they’re doing the right thing. As for that CNN report that all the Trump family and everybody have been jumping on saying, “See, this is proof that it’s fake news,” they got one thing wrong in the story, the date of a tweet. That didn’t change the fakes of any of the rest of the story. One thing was wrong, it was the date of the tweet. They issued a correction, they apologized for it and they moved on with their lives because that’s what news outlets are supposed to do. No, news outlets do not get it right 100% of the time, so when they get it wrong they come out and they issue a correction. They say, “We’re sorry. We got it wrong. We didn’t quite verify this. Somebody jumped the gun on it. Something slipped through the cracks. We screwed up. Our bad.” That doesn’t mean that everything the network says is fake. That doesn’t mean that everybody at that network is a corrupt crony trying to take down Donald Trump. It means they’re human beings. Everybody screws up and yeah, we got to demand a highly accountable media. I understand that and we should. We have to. We need it for this country to function, but to say that everything is now fake news because Washington Post got the date of a tweet wrong, that’s pathetic. And your reaction to the people in that room is becoming more and more combative and hostile each passing day. There’s going to come a time when you’re going to walk in that room and nobody’s going to be there because nobody wants to listen to your BS anymore, Sarah. You’ve got to calm it down, tone it down, stop lashing out at these people who are literally just trying to do their job. Their job is to get honest answers from you. If you’re unwilling to do that, if you keep feeding them lies every single day, then you can’t be pissed off when they report something that happens to be untrue based off information that you give them. If you want honesty from the media, you and your boss and everybody else in that White House has to start being honest too. I don’t think any of us are going to hold our breath waiting for that to happen.